If you have pets and have invested in solid hardwood floors, it is imperative that you be prepared to remove urine smells, residue and stains from your heady investment. Even if your pet is thoroughly housebroken, accidents happen and usually it is when the homeowner is not present which makes the likelihood of staining more likely. There are a number of products that are specifically designed to come to the rescue in just these situations. If possible, it is important to act fast when pets have urine accidents. The longer the urine stays on the floor, the more offensive the odor and the more damage the uric salt in the urine will cause. Uric salt from pet urine is problematic because it creates staining, odor and buildup while compromising the integrity of the hardwood. If the buildup has accumulated over time, it is unmistakable. You will not only be aware of the pungent odor, but will see black stains in the wood. When those dreaded stains appear, the floor’s integrity will also be damaged. Unfortunately, the damage to wood tannins cannot be reversed. This means that when treating the urine, we must follow several mitigation steps; to remove the urine smell and staining and then to treat the damaged wood. After we remove the black stains, the chances are good that the surface will still look gray or light black. The only way to remedy this is to refinish but let’s not put the cart before the horse. We must remove urine odor and staining before we move to refinishing. There are two core cleaners designed to specifically treat urine stains. This is a dry enzyme powder that is mixed with water and applied directly to the stain(s). Step 1 – Mix the solution. Step 2 – Pour the solution onto the stain surface. Step 3 – Allow the solution to sit undisturbed for 8 hours. Step 4 – Urine-Erase is accompanied with peroxide which should be mixed in order to create a gentle solution. Step 5 – Apply the peroxide solution, which will convert the stain and odor to an evaporable gas of water and oxygen. Step 6 – Once the area is dry, vacuum the surface to collect any residue and then clean one more time. OdorZyme – OdorZyme is an “enzyme-based urine remover that consists of a super strength plant-based surfactant.” This product actually attacks the uric acid crystals that are at the source of the stain. Because the product is sold in spray bottles, the system is easier to operate in many ways. As OdorZyme arrives ready for use, the user does not have to mix the solution; a relief for many of us. The challenge with OdorZyme is to only use as much of the product as is recommended which is basically equal to the amount of urine that caused the stain. To work its magic, the product must also be allowed to soak into the stain. With OdorZyme, it is important to follow the instructions on the case. However, an advantage of this spray is that is makes a handy spot spray. When your pet has an accident, treat the spot immediately to prevent internal damage. After applying, wait 20-40 minutes and blot up until the odor until the smell is completely neutralized and removed. After the final application, rinse the area with water and wipe clean. 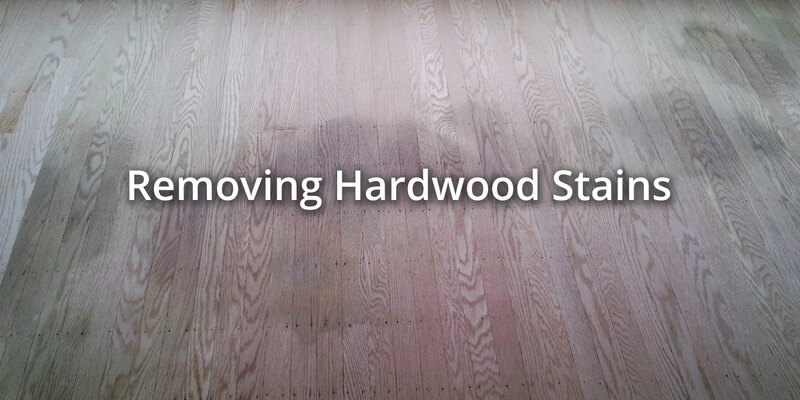 It is important that the uric salt odor and staining be neutralized before refinishing the hardwood floor. This is the only remedy to remove those lingering dark spots. Your floor will look new but you may want to make sure your pet is housebroken before proceeding. Pets and hardwood go together but once the smell of urine is in the floor, many pets regard the odor as an invitation to break the rules.